Of the 13,500 plant species that are edible, most of us get the bulk of our carbohydrate from a handful of cereals and tubers, such as potatoes and wheat. This summer’s IncrEdibles exhibition at Kew Gardens in south-west London, which is on until 1st September, aims to playfully educate, inspire and introduce you to a wider variety of edible plants. The parterre beds in front of the Palm House have been transformed into a vegetable medley including aubergine, chillies, celeriac, celery, kohl rabi, aubergines, leeks, sweetcorn, bell pepper, beetroot, fennel as well as a few runner beans, tomatoes, kale and chard. The result is worthy of permanent display. The Tutti Frutti boating experience opposite is much a more exuberant riot of sound, scent and colour, and a highlight for any one over the age of 3 years! 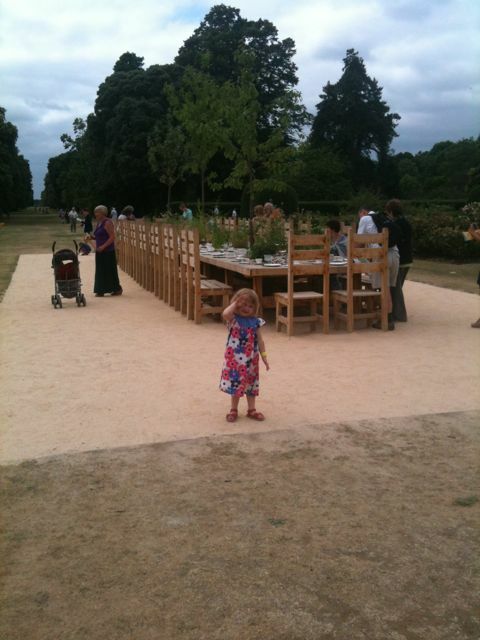 Our own Alice lingered long over the Rose Garden’s super-size tea party where a variety of edible plants are growing out of plates, cups, teapots, dishes, jugs and platters decorated with riddles and beautiful botanical designs. It was an altogether truly scrumptious day out!